The Marsh Fritillary, Euphydryas aurinia, is a species listed in the appendices to the European Union Habitats & Species Directive. The effect of this legislation is to give protection to both the animal and its habitat. The description of the life cycle of Euphydryas aurinia presented is based on the work of Dr Ken Bond of University College Cork. 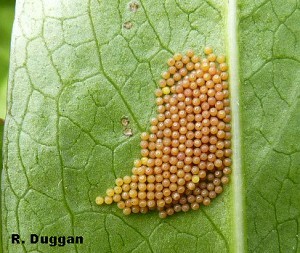 Eggs are laid soon after the emergence of the females in the middle of May. The eggs are laid in large batches of up to 350, on the undersides of basal leaves of Succisa pratensis. Large plants with well-developed leaves are selected for oviposition. The eggs are approximately 0.8mm high, subspherical and with flat top and base. When they are laid initially, the eggs are white, they then turn brown 8 days after oviposition, and finally purple-brown after 12 days. In early to mid-June, larvae hatch from the eggs. As soon as the larvae hatch, they spin a web close to the ground, on the basal leaves of Succisa pratensis. They live gregariously in this web, feeding mainly on the undersides of the leaves to which the web is attached. These early-instar larvae are black and hairy. The web is small and inconspicuous at first, but is greatly enlarged during the summer, becoming noticeable from August onwards. By late September larval webs are very conspicuous, attached to basal leaves, and frequently to other surrounding vegetation as well. The walls of the web develop a shining brownish appearance by this time. The larval web can become quite extensive by late September, and is also made conspicuous by the presence of several withered, or partly consumed leaves, spun together as part of the web complex. At this stage the larvae often leave the first web and construct a similar web on fresh leaves a short distance away, typically no more than a metre distant. In Spring, during the first milder weather with sunshine, larvae emerge to bask in sunshine, usually about the middle of March. In some years they have been observed as early as mid February (Ken Bond, pers. comm.). The black larvae absorb solar radiation, allowing them to become active early in the year in relatively cold conditions, as they can attain body temperatures well above ambient values. During the early spring the larvae again live gregariously in small groups, on or adjacent to a less conspicuous web spun on vegetation close to the ground. The larvae eventually disperse to live individually, prior to pupation, about the end of April. The pupa is distinctive in appearance, being white, with black and orange markings. It is usually attached to a twig or grass stem close to the ground from late April to early May. Although it may be clearly visible from near ground level, it is much less likely to be observed from above than the larva. Marsh Fritillary adults are on the wing from about the end of the first week of May to late June or early July, with maximum numbers in late May and early June. The butterflies are brightly patterned with black, white and orange markings. The flight season depends in part on the weather conditions. In a cool, cloudy season the flight period may be prolonged until early July. The adults have a relatively weak flight, and spend much of the time basking on flowerheads of nearby vegetation, such as Cirsium dissectum. Egg-laden females are particularly weak flyers. The butterflies are usually restricted to quite small areas, apart from late wandering females, which may occasionally be seen at considerable distances from breeding areas. According to Bond (2004), the most favourable flight period for adults is from about 10.30-16.30. In addition, the adults fly only in sunny conditions, and are unlikely to fly when air temperature is below about 13°C. The species is well known for changing its breeding locations from year to year. Sightings of individual butterflies are thus not a reliable guide to the precise whereabouts of this insect’s developmental stages and breeding at a particular location can only be confirmed from presence of the larvae. The population dynamics of the marsh fritillary are complicated and may be described as a metapopulation. 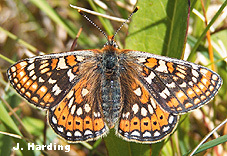 Essentially, a marsh fritillary population occurs as a series of subpopulations, the location of each of which within a site may vary from year to year. Some breeding locations within a site may be occupied one year but not the next, and vice versa. Similarly, part of a marsh fritillary population may use some breeding location within a given site in one year although the next year no part of that site may be used. Typically, a breeding location is a patch of appropriate habitat of at least 100m x 50m. 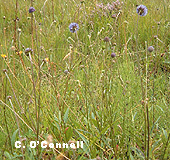 Devil’s Bit Scabious (Succisa pratensis) is sometimes extremely abundant in grassland, as in western Ireland. The plant is the main food source of the caterpillar of the scarce and declining Marsh Fritillary Butterfly. Devil’s Bit Scabious has rounded heads (18-25mm across) of dark bluish-purple flowers with purple anthers at the end of the stamens. Flowering from July to Septembe, it is a favourite of late flying insects looking for a nectar source. It is an erect perennial, with a short, thick, blunt rhizome and stems 20-100cm tall. The leaves are elliptical, the basal leaves forming a rosette, the stem leaves are narrower and are arraged opposite oneanother in pairs. The fruits are one seeded, about 5mm long. The name derives from the short thick rhizome that has an abruptly cut-off end, said to have been bitten off by Old Nick himself. It is a character as distinctive as the rich bluish-purple of the flowers. The name Scabious derives from the former use of this and related plants as a herbal cure for scabies and other unpleasant skin complaints. If you have records of the location of either the adult marsh fritillary butterfly or of its larval nests please send them together with a map grid reference or a GPS reading to the Dublin Naturalists’ Field Club or to the National Biodiversity Data Centre. Text, Photographs and Images © Irish Peatland Conservation Council (unless otherwise stated), Bog of Allen Nature Centre, Lullymore, Rathangan, Co. Kildare. Email: bogs@ipcc.ie; Tel: +353-45-860133.